Use the Easy Access Parcel Viewer to see local tax parcel data. 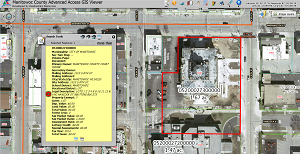 Powerful tools on the Advanced Access GIS Viewer. Public Land Survey System data and Plats of Survey in one site. Switch between multiple years of aerial photographs using the Advanced GIS Viewer. View layers like Zoning and Tax Parcels. Select an application from the Map or Records Galleries or choose to view, download, and print PDF maps that have been pre-assembled for you. 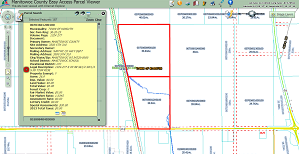 Easy Access Parcel Viewer Use this link for tax parcel maps and related data. Information for Manitowoc County is updated monthly. Information for the City of Two Rivers is from January 1, 2017. Assessment information for the City of Manitowoc is from June, 2018. Advanced GIS Viewer This link will bring you to a GIS website containing multiple data layers and tools. Information for Manitowoc County is updated monthly. Information for the City of Two Rivers is from January 1, 2017. Assessment information for the City of Manitowoc is from June, 2018. Public Land Survey System Viewer This website provides access to Public Land Survey System (PLSS) information including tie sheets, section summaries, and Plat of Surveys. Certified Survey Maps and other recorded survey maps are available on the Register of Deeds Land Records website. Data are updated monthly. Soil & Water Conservation Dept. GIS Maps This link takes you to a collection of interactive maps created and maintained by the Soil & Water Conservation Department. 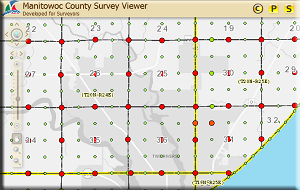 Manitowoc County Supervisory Districts & Wards Links to 4 different Supervisory Districts and Wards maps. Last updated on 7/1/2016. Twin Rivers Water Trail Interactive story map of the Twin Rivers Water Trail. Created by Bay-Lake Regional Planning Commission in 2018. City of Manitowoc Officials This map shows the Elected Officials and Aldermanic Districts in the City of Manitowoc. City of Manitowoc Street Index Map In addition to streets, this City map shows parks, schools, and many other points of interest. City of Manitowoc "Official Map" The “Official Map” of the City of Manitowoc is part of the Manitowoc Municipal Code, Chapter 22. 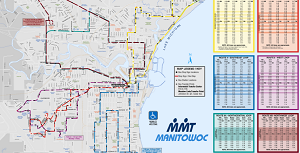 Maritime Metro Transit Routes Follow this link to download route maps or see a list of locations where you can pick up maps at no charge. Maritime Metro Transit will even mail you a copy. Evergreen Cemetery Map Evergreen Cemetery is owned and operated by the City of Manitowoc. This PDF map shows the cemetery’s layout by sections, lots, and blocks.